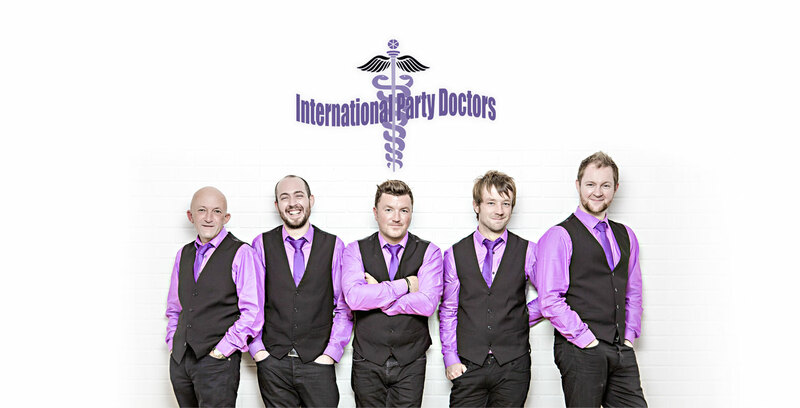 The International Party Doctors are one of the UK's foremost party/function bands. Originally formed in 2000 they set to work forming what turned out to be a very successful tribute show performing all over the UK. This culminated with a live gig performing in front 25,000 people at Party in the Park. Amongst satisfied clients to date are Ant and Dec, Ricky Hatton, Lee Sharpe, The cast of Hollyoaks and Coronation Street. Corporate clients include; The British Dental Association, Burnley Football Club, Leeds Utd Football Club, Burton Albion FC,The Rugby Football league, Halifax RLFC, Yorkshire Post, Telegraph and Argus, Telewest Communications, British Telecom, Bradford and Bingley, The Abbey National, The Pulse FM, BBC Radio Leeds, The Money Shop & Marstons Brewery to name but a few. As a result of this they soon realised that their talents could be used in a more universal show & Weddings became a huge part of what they do. 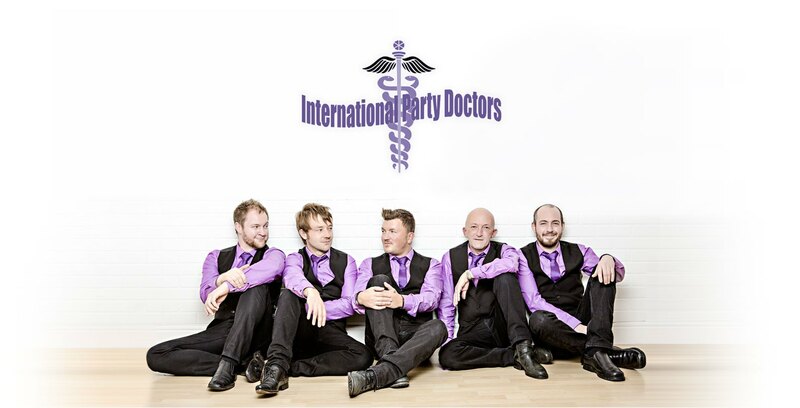 The International Party Doctors are fully seasoned and fully insured for performing at weddings & any other event. They are fully self-contained with P.A system, lights & effects owned solely by the band- so no hidden extras! So book the International Party Doctors with absolute confidence knowing that all is in hand and a great night is a dead cert! Singing part time and professionally in bands since he was 16 and playing a little guitar also. Marks experience with large and small crowds is vast, having worked as a singer and compere in Tenerife and Italy Mark soon gained the banter and the ability to perform the correct material for each event from festivals to the most intimate wedding and reads the party perfectly. JP is the newest member of the International Party Doctors and brother of Jamie. JP started playing drums at the age of 11 and has been gigging since the age of 15. Since then he has toured extensively with and supported a number of bands including Marillion, Roy Wood, Lady Gaga and Tim Burges (The Charlatans). Jamie was wanted by the band for a while but they had to join the queue due to his popularity amongst the "Rock" fraternity. Having played with and supported the likes of Metalica, The Blue Oyster Cult, Marrilion and Ocean Colour Scene it wasn't difficult to see why. He has also performed with Bob Geldolf on a successful European tour. After J.P was recruited they then went on the search for a guitarist and after hunting high and low with numerous auditions they discovered Alan. Alan had spent 12 years playing guitar with signed outfit "Bad Beat Revue". This band came to a natural end with all the players pursuing different roles within the music industry. At the time of this they were starting to break through and were performing with likes of The Kaiser Chiefs, Hard Fi and the Pigeon Detectives to name but a few. Having studied piano to grade 8 Andy turned professional in his early 20's and spent 15 years playing in 5 star venues in London, Norway, America, Saudi Arabia and Bermuda where he spent 5 years. On his return to the U.K. Andy joined his first band playing throughout the U.K. and Europe. His use of his musical knowledge and his experience enable him to bring a big sound to the band reproducing authentic sounding orchestrations. 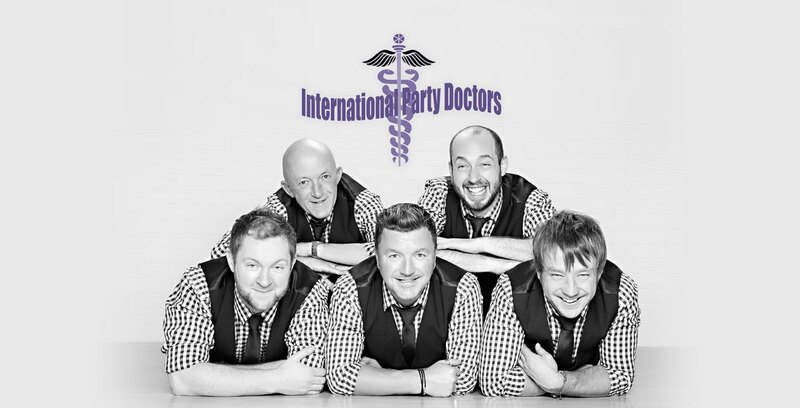 The International Party Doctors offer the finest DJ's at very competitive pricing, to add that little extra for your special occasion. We are also proud to be associated with a number of other bands, photographers and magicians should you require any finishing touches to your special day. More tracks available on request! or you can fill in the form and someone will be in touch.